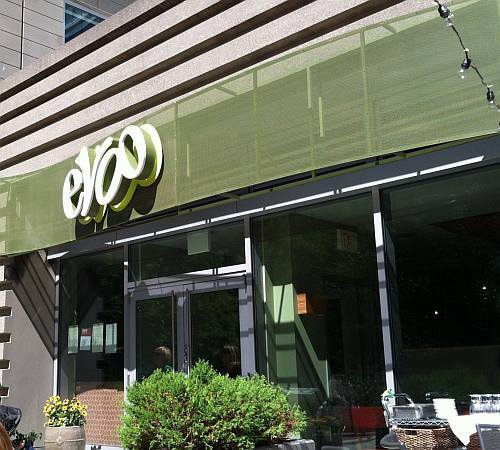 Is everyone at Kendall Square's Evoo and its sister, Za, right next door? It's Evoo for more formal meals like scallops with risotto or fig compote with lamb rillettes. You could chill out with pizza and salad at Za and slide over for dinner all without moving the car. I'll concede that we haven't but we might. Right off, Evoo changes the menu often; each day but if not, for sure by the week which means they ax a favorite without warning. I just checked: what we had, the Pig Pile, you can't so wait for it. No matter, what you will not be is bored. While many kitchens call their cuisine eclectic, Evoo has a gift for New American eclectic. And if you're going to write about novel dishes, take notes and get the menu on your way out because by the time you get around to it, they've thrown a curve and moved on. First, Julie and I come for lunch. She's picked peppery fried eggplant with cucumber salad in minty yogurt and curried tomato sauce. 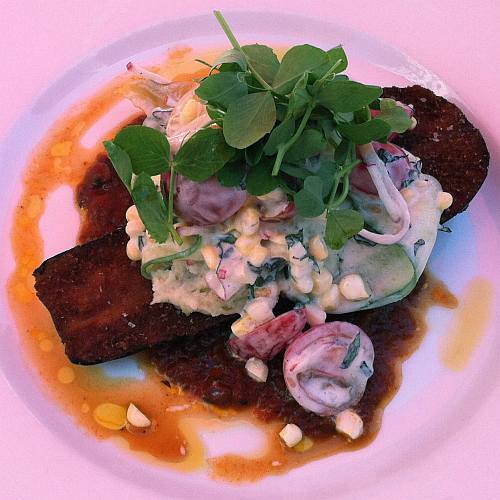 It's all here in a tower of mashed potatoes, pea shoots, corn, grape tomatoes and onion. Eggplant should always be this good. I checked: chefs call eggplant vegetables and to botanists, eggplant's a fruit. She chooses for us the Atalaya garnacha tintorera monastrell that goes down in a swirl of cherry and chocolate. No one's going back to work. When I order BLTs, they're always different. I get avocado and that's fine. I've gotten avocado and shrimp salad, which seems like a mixed metaphor somehow, and it was good. The one that landed in front of us with a crab cake on it was, I'm sorry to say, truly bizarre. Today, the BLT is a BLN where nectarine subs for tomato. 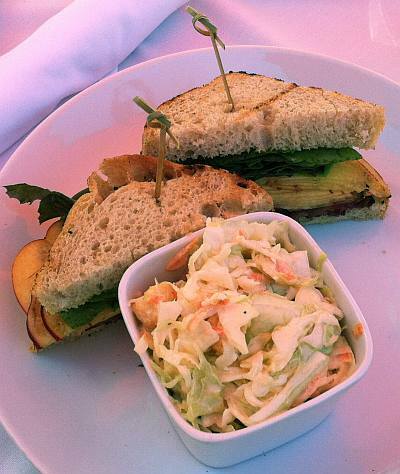 I ask our server, Ace, if she'll beg for tomato and she says, "It's really good, you should try it with nectarine." We could do that, take a dish as the chef imagines it. Lightly toasted house bread, mayo, ripe fruit, local lettuce with impressive bacon and yes, she's right. Creamy cole slaw, well, what do you say to no vinegar and corn bread croutons? Voilà. Dessert: it's warm chocolate truffle cake with toasted marshmallow cream. You know how torched marshmallow always brings back eau de s'more? For the record, s'mores at girl scout camp on Long Island were nothing like this since we had no torches, only campfires, and truffles hadn't been invented. Dinner Sunday evening is a much-needed respite from the week's drama. We are four and the hungry le bébé, who's now 2 1/2 and who used to eat whatever we put in front of her, is no more. Not even thin crispy bread sticks. Codorníu's Brut Cava goes down sparklingly. It's a first. Dilusha and I order the same thing: salmon croquette with kielbasa, kale and hollandaise topped with pea greens. Really, I ordered hollandaise? Anyway, the menu divides into small, medium and large plates. 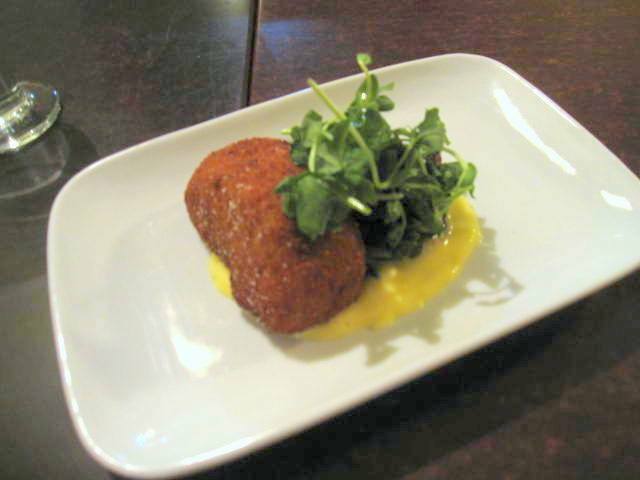 The croquette is listed as medium. We have the same reaction when the plates are set down. It's crispy and salmon's divine plus kale counteracts the hollandaise and the sausage. It's the best use of sausage and greens and no, you can't make it at home. Damnath orders the Pig Pile. Yes, that's what they call it. 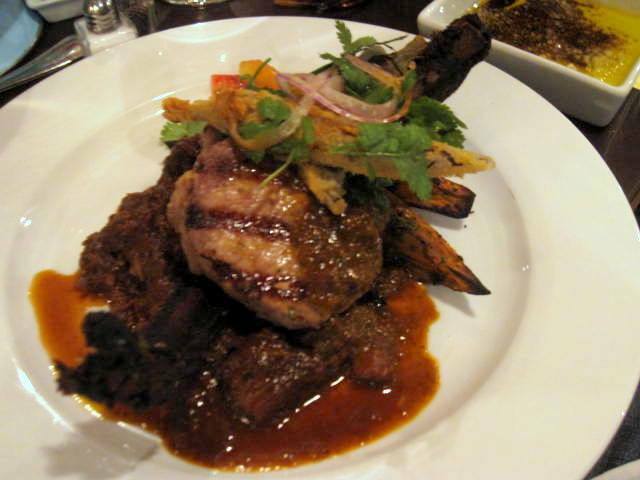 He digs into a pile of peppery pork and ribs that's been jerked into submission. We taste smoky sauce, pickled onions and okra with barbeque that's been pulled through the entire Caribbean. It's a keeper and I wonder who thought it up? You won't be turning this out at home either. 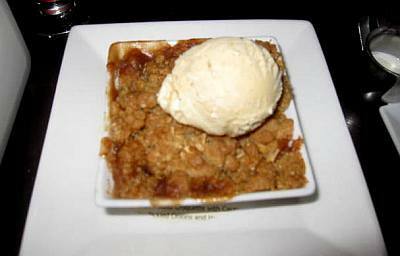 We're having dessert: we love warm apple crisp with a nutty oatmeal topping finished with brown sugar cinnamon ice cream even if there's no chocolate. After, I tuck le bébé under my arm and walk over to the open kitchen hoisting her so she can say hi to the guys. They do, she won't but she gets to see them in action. They're friendly, like the servers and host with the usual Cambridge vibe. Evoo harbors few secrets; all of their vendors are listed on the menu and if you want to eat local this is where you should be. Last word: If polenta with oxtail ragu and blue cheese or lamb chops, potato croquette and olive/pine nut salad calls, don't say we didn't tell you. Get it quick before it's history.